Posted November 16, 2017 by Josette Farrell in News. IT’S a bit Irish, but language laws have stifled attempts to put Claregalway on the map! As Claregalway is in the Gaeltacht, its official title for the purposes of road signs is the Irish version: Baile Chláir. However, this is causing confusion among motorists along the recently opened M17/M18 motorway, a County Councillor has claimed. The Oranmore/Athenry Municipal District has now agreed to write to Transport Infrastructure Ireland, and the Minster for Gaeltacht, Joe McHugh, to allow the English format of Claregalway to be included on signage. The matter was raised by Frank Kearney (FG), who said the sign at junction 19, for the turn-out for Claregalway, only has the Irish version Baile Chláir), which is causing problems. The Irish version of Claregalway is also the only version at the sign at junction 20 in Tuam, he said. “It’s causing fierce confusion, he said. “People think Baile Chláir is Belclare. Other people think ‘will it take us to Ennis or Clare?’. Traditionally Claregalway was on road signage. Not only that but the sign says ‘Baile Chláir R354’ but even that is incorrect. Baile Chláir or Claregalway is on the N83 not the R354. The signs are wrong and they are confusing and they should be changed,” added Cllr Kearney. 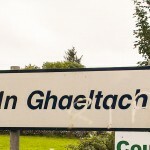 Director of Services Michael Owens explained that the Placenames Act prescribes that towns and villages in the Gaeltacht should appear on signage in Irish only.